Why is the ghd Gold Styler Iron so Effective at Straightening Fine Hair? Are you worried about flat irons that simply get too hot for your fine hair? You should be if you use them to straighten that type of hair. Fine hair is so easy to damage or dry out if you are not careful. It really does take a special flat iron to straighten your fine hair. 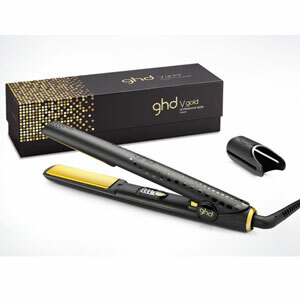 One model flat iron that many people with fine hair have been raving about is the ghd Gold Styler Iron. It has been said it consistently straightens fine hair without damaging it. All this talk certainly got our attention so we decided it was time to review this flat iron. The 1-inch wide heat plates on the ghd Gold Styler Iron are ceramic coated. We will talk more about how this helps fine hair users but it’s a big positive. It just goes a long way toward preventing heat damage to your fine hair. This is a stylish looking flat iron too. You don’t hear us make too many comments like this but the gold accents in the black matte finish make it one sleek and stylish looking flat iron. It has 3 different heat settings on it too; the highest of which is 365ºF which we briefly mentioned already. It is ready to use in less than 60 seconds too. Users really like the way the body of this flat iron is really lightweight and ergonomically designed. It only weighs around 16 ounces. The body stays cool even when using it on the highest heat setting too. This flat iron comes with a nice anti-tangle swivel end cord. The cord is 8-feet long which allows for some pretty good freedom of movement when using it. Ghd even considered safety when designing this flat iron model. It will automatically go into sleep after it has been on for 30 minutes. 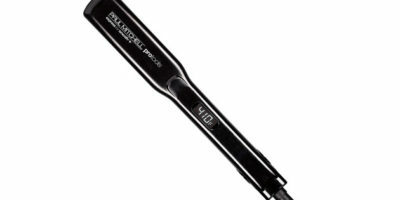 The number one reason why this flat iron is great for use on fine hair is because of its smooth ceramic heat plates. Ceramic coated heat plates are known for heating very evenly so it eliminates the threat of hair damaging hotspots. Your hair will slide across them smoothly, retain more moisture and have fewer tugs on it as you straighten it too. Fine hair also does not like to be straightened at high temperatures. High heat tends to dry and damage it very easily. Since the ghd Gold Styler Iron only has a max temperature of 365ºF it is safe to use on most types of fine hair. The warranty on the ghd Gold Styler Iron is pretty much average. It comes with a standard 2-year limited warranty on it. 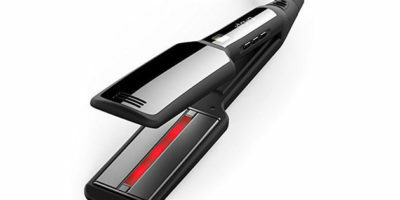 What don’t we like about this flat iron for fine hair? We do like the fact its max heat is only 365ºF. We don’t like the fact that it has only 3 heat settings on it. Since we are talking about the heat there is another concern there too. When selecting the temperature you just simply move a 4-position switch. Digital temperature selection and a digital readout would have sure been an improvement here. This is not a fancy flat iron that ghd has made here. Really it does not have to be as long as it gets the job done on your fine hair which the ghd Gold Styler Iron nicely does. We especially liked the lower heat settings on it and the fact it only has medium-high heat. This will make the ghd Gold Styler Iron especially gentle on your fine hair when using it. When you add in the fact that it has fine hair friendly ceramic hot plates then it’s a flat iron that should seriously be considered for purchase by any person that wants to straighten their fine hair.